Our Imperial Muscatel 2nd Flush tea from the latter part of the spring pluck at Giddapahar Tea Estate this year is for those who prefer that their Darjeeling tea has a rich, mouth-filling, smooth-around-the-edges and ‘traditional’ china bush style. 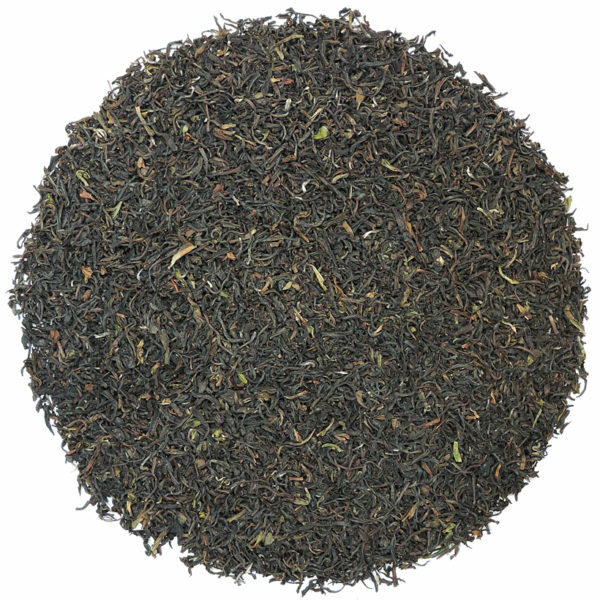 This style, in which the wither is short and the oxidation long, is often referred to as ‘muscatel’ in Darjeeling, and is clearly different than the green-ish style that is a result of a long wither and short oxidation. While the latter style has seemed so prevalent recently, we are seeing more of this traditional muscatel style now, especially in the manufacture of the 2nd Flush teas, and we think this is great. The 2018 harvest was perfect for this more traditional wither/oxidation balance due to the late harvest and larger leaf particle size. The dry leaf is slightly large due to the plentiful rains this spring. This china bush leaf has the classic 2nd Flush aroma in its dry leaf: pure, clean and straightforward. The considerable aroma that is contained in the leaf releases readily upon application of the steeping water, and will vary in intensity depending on the temperature of the hot water. Very pleasant and highly desirable aromatic qualities are released by the wet leaf during steeping. While the dry leaf has hints of melon, cacao, and dry wood bark in the aroma, the wet leaf releases these aromatics in restrained abundance. Cacao and the classic aroma of a high quality china bush black tea are the primary elements of this enticing tea – in total, the oxidized smell that so distinctively identifies this traditional style of 2nd Flush wither and oxidation, whether from eastern China or from northern India. The leaf is classically beautiful, very dark in color, with not a trace of any modern, trendy, green, long-withered leaf. 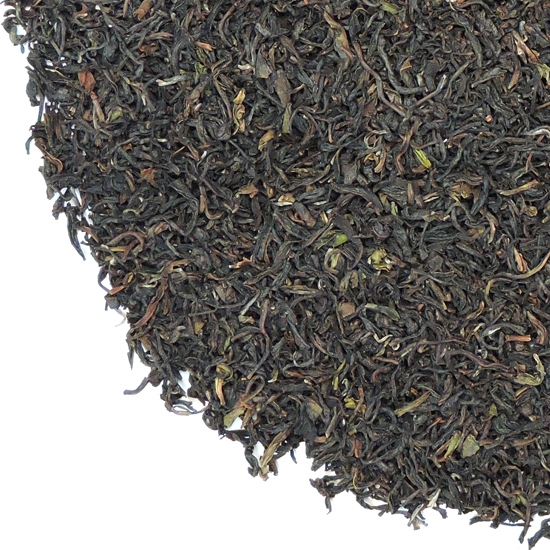 The leaf is long and wiry, very even in composition, and has the rich classic color of a traditional 2nd Flush Darjeeling. The base flavor of this Darjeeling, the Giddapahar Tea Estate Imperial Muscatel 2018 2nd Flush, is that of a classic 2nd Flush Darjeeling. This taste could serve as the model for its genre. Lush, deeply-flavored, and without astringency, it possesses a significant raisin-y taste on top of its muscatel flavor. There is a show of biscuit in the mix, without its becoming overly dry. Layered on top of this traditional Darjeeling 2nd Flush flavor is the influence of the china bush taste, which offers the cacao and and dry wood bark attributes. This tea is so well-balanced and smooth that it could almost pass for an eastern China tea, but the core Darjeeling flavor keeps it firmly in the Darjeeling flavor profile in the final analysis. Very full-bodied, the soft, muscatel flavor is in perfect balance with the body and aroma throughout the drinking experience. The leaf is very darkly-colored and is well manufactured. It has a wiry style that is unusual for a Darjeeling manufacture, but is perfect for this tea, given that this is a china bush planting. The leaf has a nice length and even twist. Showing beautiful liquor color of deep claret-amber, this tea is a stunner. We are recommending a moderately short steep for this tea. I have been steeping it for about two and a half minutes. The leaf is large for a Darjeeling, so use a generous measure. We have been quite successful re-steeping the leaf, often for quite a long steeping time – even 4 minutes. Giddapahar Tea Estate is located in the most prestigious heart of the Kurseong Valley. (Giddapahar is translated from Nepali to mean Eagles’ Cliff). Giddapahar Estate is owned by fourth generation Surendra Nath Singh and his brother, and is a relatively small area of 109 hectares. The gardens are poised at an average altitude of 4,800 feet and their orientation offers an incredible view of the Himalaya. The garden was first developed in 1881 and has been producing fine tea continuously. Giddapahar is one of the few remaining tea estates with gardens that still produces tea from older plantings of China bush tea varietals. We feel that leaf from these tea bushes adds body and richness to the mouth-feel of a fine Darjeeling, so we always look for these ‘gems’ from the few gardens that still maintain their long-lived China bush stock.